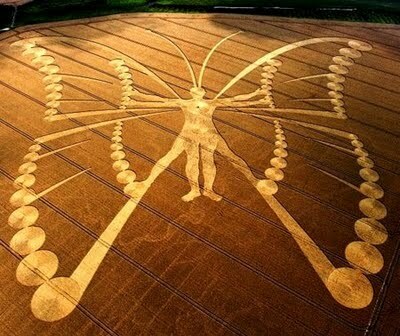 As perhaps a "cosmic joke" or at least a cosmic tickler, please notice that this crop circle that appeared just before our book launch last year looks a lot like our book cover. To answer your question before you ask, book publicists from the Pleiades are hard to find -- and don't even ask what they charge. the greatest adventure in human history – conscious evolution! Economic meltdown … environmental crisis … seemingly endless warfare. The world is in critical condition. We’ve all heard stories of people who experienced seemingly miraculous recoveries from illness, but can the same thing happen for our world? According to pioneering biologist Bruce H. Lipton, it’s not only possible, it’s already happening. We are surrounded by the proof that we are poised to take an incredible step forward in the growth of our species. In Spontaneous Evolution, this world-renowned expert in the emerging science of epigenetics teams up with political philosopher Steve Bhaerman to offer a new and hopeful story about humanity’s evolutionary destiny. • How each of us can become planetary “stem cells” supporting the health and growth of our world and every individual in it. By releasing the old beliefs that keep the status quo in place, and by building our lives and world on this heartening new story, we can trigger the spontaneous evolution of our species. Infused with intelligence and wit, Spontaneous Evolution is an insightful, playful, and ultimately hopeful look at the unfolding destiny of our species—and how you can play an active role in birthing the evolution of humanity. Bruce H. Lipton, Ph.D., is an internationally recognized authority in bridging science and spirit and a leading voice in new biology. A cell biologist by training, he taught at the University of Wisconsin’s School of Medicine and later performed pioneering studies at Stanford University. Author of The Biology of Belief and recipient of the 2009 Goi Peace Prize, Bruce has been a guest speaker on hundreds of TV and radio shows, as well as keynote presenter for national and international conferences. Steve Bhaerman is an author, humorist, and political and cultural commentator, who’s been writing and performing enlightening comedy as Swami Beyondananda for over 20 years. A pioneer in alternative education and holistic publications, Steve is active in transpartisan politics and the practical application of Spontaneous Evolution. Order now, and receive three bonus articles FREE that could not be included in the book due to space considerations. Not available anywhere else! Spontaneous Evolution is the life-map we’ve all been waiting for! With just the right blend of spiritual humor and rock-solid-science, Bruce Lipton and Steve Bhaerman cast a holistic new light on an emerging new civilization. They lead us beyond collapsing economies and religious extremes to show us that such chaos is a natural step in an unfolding process, rather than the tragic end to a broken planet. Once we recognize the big picture, the choices to a better life and a better world become obvious. The guiding role of Spontaneous Evolution is where our teachings of life, history, and civilization should begin. I love this book! -- Gregg Braden, New York Times best selling author of The Divine Matrix and Fractal Time. The implications of this powerful book have the potential to change the world. This wise and thoughtful book is a powerful antidote for anyone who is pessimistic and depressed about our future and the challenges we face as humans. Spontaneous Evolution is a world-changing book that offers a heartening view of humanity’s destiny. Built on the foundation of the latest discoveries in science, it points us in the direction of functional politics, sustainable economics, and individual responsibility in the context of an interdependent community. Spontaneous Evolution offers an enlightening view of humanity's past, and empowering vision of our 'mammalian' destiny. Based on cellular biologist Bruce Lipton's solid science, informed by Steve Bhaerman's political insight and wit, this book is a must-read for anyone who seeks to livingly transfrom the world, and fulfill her or his most creative and powerfulself. Spontaneous Evolution is a great book, a vital message, and even more, it embodies Causal Evolution. By understanding and incorporating its wise revelation of how nature works, we can cause the future we intend. The future that emerges from this Whole New Story is so attractive that I believe it will encourage us to fulfill our true hearts' desire for more love, more life, more creativity NOW. —Barbara Marx Hubbard, Founder, The Foundation for Conscious Evolution. Spontaneous Evolution is a brilliant synthesis of science, evolutionary theory, and spiritual consciousness that provides a unique explanation of our global situation and how we might move forward to repair the world. It charts a path for a global "up-wising" that could save us from planetary disaster, recognizing that both we as individuals and the global economic/political systems in which we operate, must evolve quickly to survive. —Rabbi Michael Lerner is editor of Tikkun www.tikkun.org, chair of the interfaith Network of Spiritual Progressives, and author of The Left Hand of God. In Spontaneous Evolution the authors redefine our commonly accepted understanding of 'evolutionary destiny', placing the responsibility right where it belongs: within the mindful awareness of every individual. Their presentation of 'holism' gives us all reason to be optimistic. Spontaneous Evolution is an eye-opening, mind-expanding, and paradigm-shifting journey. the alchemy that happens when Bruce Lipton's cogent articulation of cellualar biology and physics joins Steve Bhaerman's lucid explanations of social, political, and economic science produces a coherent depth of 'field' perspective that is both illuminating and inspiring. Bruce and Steve have given us a guidebook for becoming sane in a dysfunctional world. An extraordinary and timeless gift to humanity. The future you dream of is as close as your own cells! Spontaneous Evolution is a wonderfully exciting, enlightening, and heartening ride! Read it and know exactly where we stand and how we can thrive. From imaginal cells to cellular transformation, Spontaneous Evolution domonstrates the power of thought and intention in manifesting systemic change in both personal and social consiousness. The mix of leading-edge science and social/political awareness renders this book a must-read for all those working to create a more just, sustainable, and peaceful world. Most wake-up calls are negative. Things are falling apart, the center does not hold, and we are thrown into shock, feeling we'll have to stop the world, look the coming disasters in the eye, and somehow overcome the fight-or-flight knot in our brains that keeps us from acting wisely. Spontaneous Evolution is a call to wake up that feels as if someone has finally turned on a light. It's a prescription for becoming who we're supposed to be. It's all here, biologically, scientifically, historically mapped for us to trace and follow. No, it goes well beyond maps -- this is a GPS to send us along to our best future. In his earlier book, The Biology of Belief, Bruce Lipton wrote: "At every level and every stage of development, there is either love - and with it, growth - or fear, and with it protection and a thwarting of growth." In training first responders and medical personnel around the world how to speak to help people heal, I often say that the best way to heal is to set a trajectory for it in your mind. Imagine what you want to have happen, not what you don't. Spontaneous Evolution shows us a trajectory for healing ourselves and our world. It provides a picture of the direction in which we must go. And because one of the authors is a scientist and the other political activist, its visions are in the same spirit as Einstein's, who said that, at its best: "Imagination is everything. It is the preview of life's coming attractions." This amazing tome is so comprehensive, it embraces every aspect of life on earth, from the beginnings through Darwin and Newton to our present disastrous financial system. It takes us from the clear-eyed Native American origins of our country to the current corruption of our seeds and food sources. But at all times, the authors keep the "coming attractions" in mind. And--and I believe this with all my heart--Conscious Evolution shows us that we don't always have to learn from pain and fear. That old model, too, can be abandoned for something better. We can learn from enlightenment. And from the wonderful examples in nature, from the way single cells figured out how to become us... and the we, we are to become. The model Lipton and Bhaerman offer, instructs us that it was cells WORKING TOGETHER to increase the size of their membranes that increased their consciousness. That was the brilliant secret. They quote the assertion of American biologist Lynn Margulis that "Life did not take over the globe by combat, but by networking," and this model leads to the idea that we are all cells in this humanifest destiny and there would be no sense in the liver attacking the kidney. As wise beings have said all along, it is love that will save us. This a book about everything. Fractal geometry and world peace. How it all came to be and what it all can become. 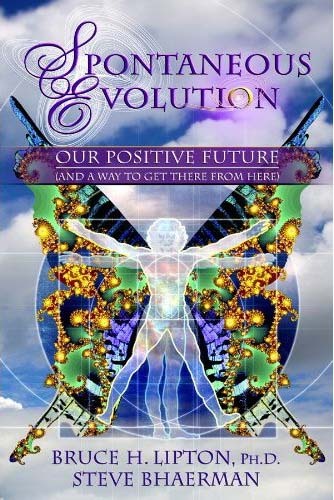 It is the one book you need now and into the vast, potential future that we are all creating. There is so much in this book to love, and even the most complicated arguments are delightfully, captivatingly delivered. I wish I could give it six stars. It is a well-organized smorgasbord of riches building to a conclusion that makes this planetary journey of ours both comprehensible and, if we follow it's wisdom, altogether beautiful and brilliant ... and promising. Let it turn on that light in your mind!